Energy efficient technologies are among the best upgrades available for property owners, reducing the operating cost and environmental impact of buildings. When energy efficiency measures are deployed with professional assistance, their payback period is only a fraction of their service life, and each dollar spent upfront is recovered multiple times. Introducing legislation that requires a minimum energy efficiency for all buildings, especially those under municipal ownership. Creating incentive programs to reward buildings that exceed certain efficiency metrics. Direct investment to improve the efficiency of public infrastructure. 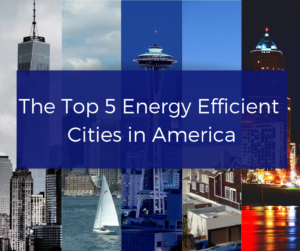 Various organizations have ranked US cities based on their energy efficiency. Two of the most prestigious energy rankings are the ENERGY STAR Top Cities and the ACEEE City Energy Efficiency Scorecard. ENERGY STAR is an energy efficiency program from the US Environmental Protection Agency, which has saved over $362 billion in energy expenses since 1992. ACEEE stands for American Council for an Energy-Efficiency Economy, an organization that drives energy efficiency through policy analysis, research and public outreach. The ACEEE Scorecard considers five main categories to assess the energy efficiency of cities. Each category has a maximum score, and the total score can reach a maximum value of 100. This section provides an overview of the top 5 cities in the latest ACEEE ranking, published in 2017. Since cities are scored every two years, the next ranking can be expected during 2019. The Climate Action Plan, which aims for a 25% emissions reduction by 2020, and 80% by 2050 (based on a 2005 baseline). The 2020 goal has already been reached. By the time of the report, Boston had already upgraded over 76% of its street lighting to LED, with cumulative savings of 35.6 million kilowatt-hours. All new municipal buildings in Boston must achieve LEED Silver certification from the US Green Building Council. Commercial and multifamily projects over 50,000 sq.ft. must meet at least the basic requirements for LEED certification. The Greenovate Boston initiative provides technical guidance to help homes and businesses reduce their energy consumption. The program also has the goal of planting 100,000 trees in the city by 2020. Boston has a stringent energy code for the building sector, which exceeds the performance level of the state energy code by 20%. There are statewide incentives for employers who deploy electric vehicle chargers, and new residential & commercial developments must have EV chargers in at least 5% of parking spaces. The 84.5 score achieved by Boston is broken down as follows: 8.5/10 in Government, 9/12 in Community Initiatives, 26/28 in Buildings Policies, 20/20 in Energy & Water Utilities, and 21/30 in Transportation. New York City has been characterized by its energy leadership, with demanding construction codes for buildings, and incentive programs for those who exceed their requirements. Like Boston, NYC has set the ambitious goal of reducing emissions by 80% by 2050. NYC has deployed fuel economy and fuel reporting measures for the municipal fleet, and biodiesel for trucks. In recent years, NYC has been upgrading over 250,000 street lights to LED. The project is expected to yield $14 million in annual savings – $6 million in energy and $8 million in maintenance. Any building that gets at least $2 million of funding from the city must be LEED Gold Certified. This covers the majority of municipal buildings. The Greener, Greater Buildings Plan is a set of laws published in 2009, which introduced stringent energy requirements for buildings. Among them is the NYC Energy Conservation Code, which is updated every three years. Starting from 2020, all buildings with at least 25,000 sq.ft. will be required to display their ENERGY STAR score and energy grade in a location visible to the public. Consolidated Edison, the power company serving NYC, manages a large incentive program for customers who deploy energy efficiency measures. Small upgrades like LED lighting and smart thermostats are given away for free in some cases. There is a statewide target to use 50% renewable energy by 2030, complemented with a large-scale incentive program for solar and wind power systems. The 79.5 score achieved by NYC is composed as follows: 9/10 in Government, 8.5/12 in Community Initiatives, 25/28 in Buildings Policies, 13/20 in Energy & Water Utilities, and 24/30 in Transportation. Seattle had the highest score among west coast cities in the latest ACEEE ranking. The city has become green with measures similar to those used in Boston and NYC. Seattle has a Climate Action Plan that aims for an 82% reduction in building emissions by 2050, using 2008 as the baseline. The city also has a 20% energy use reduction target for municipal buildings. The Green Fleet Action Plan aims to reduce municipal fleet emissions by 50% by 2025, with respect to 2013. Seattle has fully upgraded its 41,000 residential streetlights to LED, and over 17,000 of the 31,000 arterial lights had already been converted to LED when the last ACEEE report was published. LEED Gold certification is mandatory for city-funded building projects and renovations above 5,000 sq.ft. The Seattle Energy Code is very stringent for commercial buildings, being 20% more demanding than ASHRAE 90.1-2013. The Building Tune-Up policy requires periodic upgrades for non-residential buildings with at least 50,000 sq.ft. The 78.5 score achieved by Seattle is composed as follows: 7.5/10 in Government, 9/12 in Community Initiatives, 24/28 in Buildings Policies, 17/20 in Energy & Water Utilities, and 21/30 in Transportation. Los Angeles and Portland both scored 76.5 in the ACEEE ranking, but the score composition is different for each city. LA scored 8.5 points higher in the Buildings Policies category, but Portland compensates this by scoring higher than LA in the other four categories, most notably in transportation. The Sustainable City pLAn establishes targets for both emissions reduction and energy savings. The emissions reduction target is 55% by 2035, based on 2008; while the energy savings target is 25% by 2035, based on 2013. 50% of all new light vehicles purchased for the municipal fleet are electric, and the requirement will increase to 80% in 2025. The LED Streetlight Replacement Program has upgraded over 80% of street lighting, while adding automatic controls. LEED Silver required for public buildings over 7,500 sq.ft. and for those built before 1978. LA aims for 15% renewable electricity generation by 2020. LA follows the California Green Buildings Code and Building Energy Efficiency Standards. Commercial and multifamily buildings are subject to energy audit and retrofit requirements since 2016. The 76.5 score achieved by Los Angeles is composed as follows: 8.5/10 in Government, 10/12 in Community Initiatives, 25.5/28 in Buildings Policies, 14.5/20 in Energy & Water Utilities, and 18/30 in Transportation. The Climate Action Plan aims for a 53% emissions reduction by 2030, based on 2007, and there is a municipal energy savings goal of 2% per year. The specific emissions reduction target for buildings is 25% by 2030. 20% of the municipal fleet will be converted to EVs by 2030. Over 75% of the 41,000 street lights in Portland had been upgraded to LED at the time when the last report was published. LEED Gold certification is required for new city-owned buildings, and LEED Silver is required for existing buildings. Portland is working to develop low-carbon district heating and cooling systems. The Oregon Energy Efficiency Specialty Code applies for residential and commercial construction, and there are incentives for exceeding its requirements. While Portland is tied with LA, the breakdown of its score differs: 9/10 in Government, 11/12 in Community Initiatives, 17/28 in Buildings Policies, 15/20 in Energy & Water Utilities, and 24.5/30 in Transportation. The ENERGY STAR ranking is different from the ACEEE ranking because it only focuses on building performance, not the overall city performance. Los Angeles and New York City are the only two cities with top 5 spots in the two rankings. Government commitment with energy efficiency and emissions reduction is among the key factors that makes cities greener in the US. The top 5 cities in the ACEEE ranking all have emissions reduction targets, along with stringent energy codes to improve the performance of the building sector. Other common measures including LEED certification for city-owned buildings, and LED street lighting upgrades. ENERGY STAR certification is less dependent on city policies, since it is managed by at the federal level by the US Environmental Protection Agency. An ENERGY STAR Certified building outperforms 75% of buildings of the same type, while achieving a significant reduction of energy costs and greenhouse gas emissions. Before you leave… Find more about energy efficiency, solar news, United States energy deregulation and Texas electricity on the Quick Electricity Blog. Why is Energy Conservation Important? How Does Recycling Conserve Energy?